On 12 August 1883 at 8:00 a.m., Mexico’s Zacatecas Observatory’s boss Jose A. Bonilla was preparing to study the Sun’s corona when he observed an amazing phenomenon. He saw several distant objects that were close together and crossing the solar disc. In the space of two hours, while the sky was clear and he was able to observe, he counted up to 283 bodies that crossed in the angular field of view of the projection lens. Between 8:00 a.m. on August 12 and 8:40 a.m. on August 13, 1883, Bonilla counted a total of 447 objects in the course of 3 hours 25 minutes of clear sky observation windows. That is an average of 131 objects per hour, meaning a total of 3275 objects must have passed the solar disk within 25 hours. Geometry of Bonilla’s observation: Z (Zacatecas), M (Mexico City or Puebla) and O is the point at which objects were observed. D is the distance from the Zacatecas Observatory to the objects and d is the distance between Zacatecas and Puebla or between Zacatecas and Mexico City (Credits: Hector Javier Durand Manterola, Maria de la Paz Ramos Lara, and Guadalupe Cordero). At the time, there were several theories to try to explain the phenomenon, but none was very conclusive. The magazine’s editor used the “flock of bird” theory as a plausible explanation: he assumed that the objects could have been birds that crossed in front of Bonilla’s telescope. The fragmenting of previously observed comets in the same year, 1883 I (Brooks-Swift) and 1883 II (Pons-Brooks), could not explain Bonilla’s objects. Other astronomers adopted Bonilla’s event as the first evidence of unidentified flying objects (UFOs). Strangely, it appears no one else on the planet observed those fragments or the comet passing in the face of the Sun. In fact Bonilla noted in his report that the phenomenon was invisible to the nearest observatories of Mexico City and Puebla, which were just a few hundred kilometers away and were informed of the event after his first observation on August 12th. Manterola and his colleagues explain the invisibility using parallax. They point out that if, according to Bonilla’s information, the objects were invisible to observers at Puebla and Mexico City, then the fragments must have been close to Earth such that the objects would have been in line with the Sun only when viewed from Zacatecas. 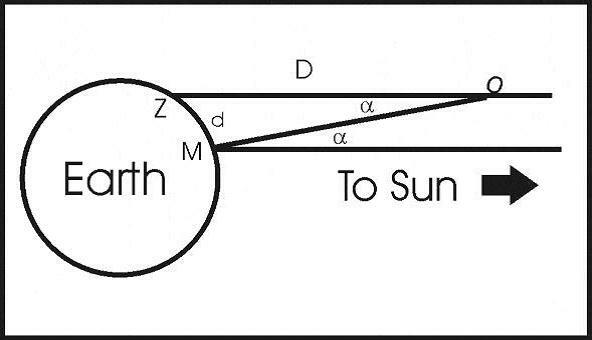 Parallax would have ensured that the objects were not aligned with a visual to the Solar Disc for other observers including those from Sahara, northern India and South-East Asia, that are located along the same latitude as Mexico. The authors have used the invisibility aspect to place limits on how close to Earth’s surface the fragments must have been: between 500 km and 8000 km. That range lies in low Earth orbit (LEO) where, today, it could pose serious collision risk to active communication and observation satellites. More so, a few thousand kilometers from Earth is quite small when compared to astronomical distances. Imagine a Bonilla fragment at that distance and travelling at a velocity somewhere between 15 and 75 km/s, the velocity of meteors when entering Earth’s atmosphere: it is like a bullet grazing your head so close it shaves off some hair. There is more to Manterola et al.’s deductions. They estimate that the widths of those objects must have ranged in size from 50 to 800 meters and their lengths from 70 to 1000 meters, which coincides with the values measured for the fragments of 73P/Schwassmann-Wachmann 3 comet which broke apart as it reentered the inner Solar System in 2006. In their analysis, they estimate that the mass of the comet before fragmentation was huge, a billion tons or more, approaching the mass of Halley’s Comet. 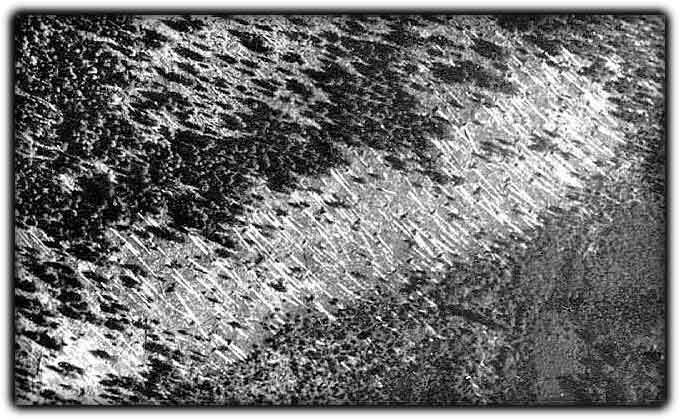 Tunguska region in 1938: Portion of one of the photos from Kulik’s aerial photographic survey (1938) of the Tunguska region. The parallel fallen trees indicate the direction of the blast wave. About 2150 square kilometres of Siberian taiga were devastated and 80 millions trees were overthrown (Credits: University of Bologna). The Tunguska event was a large explosion over northern Russia in 1908 and it is the only entry of a large meteoroid in the modern era with first-hand accounts. The generally agreed upon theory is that the Tunguska event was produced by a 100 million kg space rock 60 m across that entered the Earth’s atmosphere and detonated at an altitude of 8500 m above Siberia, producing a fireball and releasing energy equivalent to about 185 Hiroshima bombs. That could’ve wipe out the largest metropolitan city with a population of about 33,000,000 had it been anywhere in the vicinity. Now imagine 3275 Bonilla fragments, each with a destructive power equivalent to 185 Hiroshima bombs, all hitting Earth within two days. That would be a total destructive power of over 600,000 Hiroshima bombs, enough to wipe out Earth’s entire population today. An impact in water near a city could have created a dangerous tsunami. It seems Earth narrowly avoided an extinction event just over a hundred years ago. The observed phenomena lasted 3 hours and 25 minutes. During that timespan, the Earth moves 370 000 km (one earth-lunar distance) in its orbit, and the earth surface itself considerably rotates as well during this timespan. This means that the parallax argument Manterola et al. invoke to explain why the objects were not seen during simultanious solar observations from a.o. Mexico City *does not hold up*. These objects *should* have been seen from Mexico City (and in fact, from any other place on earth) as well. The debris stream should be at least 20 earth diameters wide in order for these fragments to be seen over a 3 hour 25 minute timespan. The whole observation is beyond credibility. Objects must be *very* bright to be seen near the sun, through a solar filter (!). The whole description instead points to something in the telescope system itself (dust), or perhaps the eye-brain system of the observer.